Wherefore art thou not in the top 10, Romero? 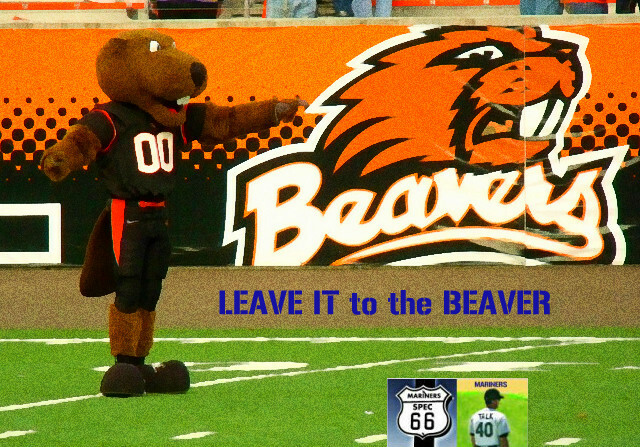 Cheesy MarinersTalk.com catchphrase: Leave it to the Beaver! Romero did not join the Beavers until after their unlikely back-to-back national championships in 2006 and 2007. The 2007 North Carolina team vanquished by the pre-Romero Beavers did include a trio of freshmen named Ackley, Seager and Moran (see below). The greatest ex-Beaver of all time is probably Jacoby Ellsbury, which I guess tells you how many successful major leaguers have come from there. Next would be '70s Astro Ken Forsch who had a 3.37 ERA but a 114-113 record. Funny thing with Stefen Romero. A year ago at this time, he was squarely on my radar, and I put him in the initial Talk40 at No. 32. At the time, I think Gordon and Lonnie were the only other ones even mentioning him. Then, all of the sudden, he became a sensation and everyone is ranking him near the top. Now, I'm in the position of having to explain why I don't have him as high as everyone else. He's reluctant to draw enough walks. That's not just a High Desert thing. It was at Oregon State, Clinton and Jackson, too. Except for one season at OSU ... under 7%. The failure to consistently draw walks was the main reason that the "Spectometer" projected that Jose Lopez would not have long-term MLB success. One of the most consistent things I've found is that hitters need to show the ability to get either an extra-base hit or a walk at least 19% of the time in the minors. If they don't, they're relying too much on singles. Even in Romero's awesome 2012, he only reached 17.6% in that category, because of the low walk rate. If he's going to keep walking under 7% he puts a huge amount of pressure on himself to hit. Another thing I've found is that there is often (not invariably) reason for skepticism when a guy doesn't bust out in the minors until age 23. At that age, he is almost always older and more experienced than his opposition. It's one reason I never warmed up to Casper Wells. He never put up interesting stats until he was old for his level. So Romero has the "Jose Lopez" red flag (perpetual low BB%) and the "Casper Wells" red flag (lukewarm until age 23, then bust out). Romero struggled with injuries at Oregon State that held back his placement, and that helps explain why he was still at High-A at age 23. And ... he has a major "sleeper" indicator, which is: generating a ton of power with a very low K%. And ... he played every game at 2b and ought to handle 3b, which gives him a great deal of value over a guy without that versatility. So I'm not against him, I'm just a tad more skeptical than most, and that doesn't mean that I'm denying there are lots of positive signs. Here's the last out from 2007. Dustin Ackley made the next-to-last out. Oregon State Beavers are the College World Series Champions! Video of Oregon State Beavers are the College World Series Champions!